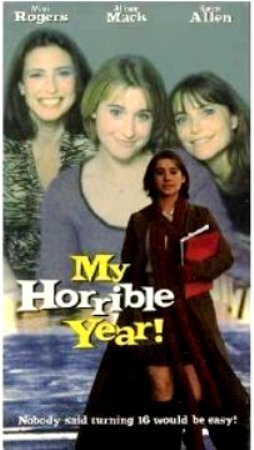 My Horrible Year! is a TV film written by P.J. McIlvaine and shot in Toronto under the working title Annus Horribilis. It was first broadcast on Showtime in July 2001. Other than directing the film, Eric also played a small role in it. The film was nominated for a Daytime Emmy for Outstanding Directing in a Children’s Special, and J. Adam Brown was nominated for a Young Artist Award for Best Performance in a TV Movie or Special by a Supporting Young Actor. My Horrible Year! was released on VHS in October 2002 and has yet to be released on DVD. After her favorite uncle passes away, fifteen year old Nik feels herself trapped in the world of braces, babysitting, crushes, and suburban life until she overhears a conversation between her parents. Now Nik is convinced that her father is having an affair with her widowed aunt and that her parents are going to announce a divorce on her sixteenth birthday. Despite the reassurances from her non-conformist friends, Babyface and Mouse, that divorce is not the end of the world, Nik will try anything to keep her parents together. Although some may see the film as too sweet, or perhaps innocent, what Stoltz likes about the characters is that they’re not cynical, an element which he says is lacking in films for teenagers today. “I have relatives that live in the Midwest and when you get out of New York and LA, which is something I try to do occasionally, you find a great deal of kids that have hope and vitality, and that often carries them through different situations.” Stoltz and Rogers also both appear in the film as Nik’s uncle and aunt. While Stoltz is very nonchalant about his own role, (“I only worked as an actor, maybe 2 days” ), he’s more serious about Rogers. But in the end, he made the film for himself.